Masks with special abilities for your Minecraft character. 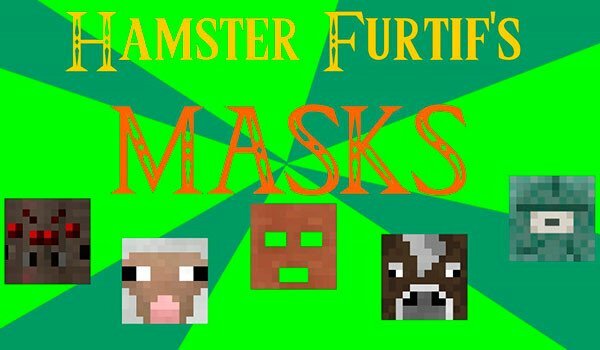 Masks Mod 1.8 is a mod that allows us to craft masks our character, that beyond offering the chance to put your character a mask with the appearance of some animals and mobs, we give special abilities. The mod lets you create sheep masks, skeleton, spider, cow, Creeper, Guardian, Guardian of Enderman and Elder. Some of the skills that allow us to eat these masks are high boiling, or eat “grass” to regain health. Avoid being attacked by the Guardians and marine Elder Guardians, skeletons, Creeper, night vision under water or underwater breathing. How to install Masks Mod for Minecraft 1.8?